If it had not been for the “bulls eye” rash, I wouldn’t have even known that I had been bitten by a tick. The infected tick had fallen off days or possibly weeks before, but there it was. Seeing that expanding rash, I then knew that the achy, blah feeling was not just some summer bug I had caught: actually a bug, in the form of a deer tick (Ixodes scapularis) had caught me! I had contracted Lyme Disease. This was in the summer of 2012, and am happy to report that I have since made a full and complete recovery. 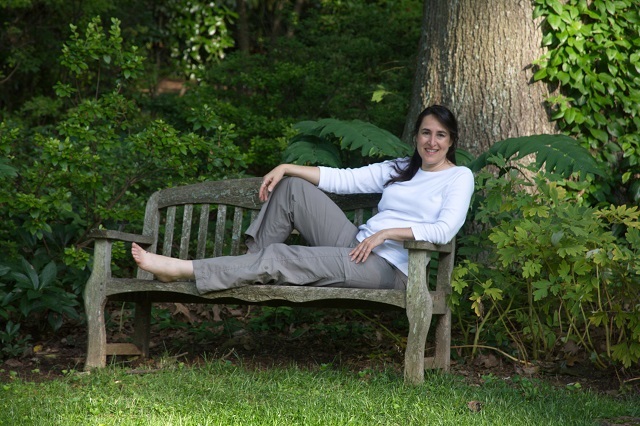 For me, since I help treat yards to prevent ticks and mosquitoes from injuring families, it was easy to pinpoint where I picked up the infected tick– a property inspection. My rash from Lyme Disease. Lyme Disease is a mystery in many ways. Because I had the tell-tale rash, it was also easy to diagnose and positively treat. Not everyone is as fortunate. It is important to understand though, that the rash is not present over 20% of the time. Combine this with the fact that Lyme Disease can many times mimic other illnesses with its symptom list of fever/chills, body aches, swollen lymph nodes, a vastly larger segment of society may actually be suffering from Lyme Disease, without even realizing it. Keep compost and debris piles clear from play and dining spaces. Adult ticks natural habitat consists of damp, cluttered spaces. Ticks thrive in moisture and do not do well in dry heat. By having a well-trimmed yard versus a wilderness wonderland, you eliminate the “questing” point for ticks. Ticks will perch with their back legs on long grass or branches and hold up their front legs, ready to grab on and scurry up the leg or arm of any creature, be it dog, cat, deer, or human. Their favorite latching places are armpits and the groin. No long grass means no place to quest from. Ticks have known hideouts. Some of their favorite places are fences, brick walls, retaining walls, including walls that are also used as seating areas on your deck or patio. Check these spots regularly for ticks and “clutches.” A clutch is a mass of up to 2,000 tick eggs. Pets can not give you Lyme Disease, but they can bring ticks into contact with your family. It is important to use preventative care with your pets as well, especially dogs, since they can contract Lyme Disease. Call the pros for a barrier treatment spray. An effective spray will eliminate live adult ticks on contact. Thankfully, we offer effective Montgomery County MD tick control. It’s a personal commitment, for me and my wonderful team of trained professionals to protect your landscape from these predatory invaders. Ticks can live somewhere else other than our yards. Myself and many of our friends and neighbors, including college-aged kids and vibrantly healthy individuals, have also suffered from the debilitating effects of Lyme Disease. To eradicate up to 85% – 90% of the adult ticks on your property, we use an EPA-approved barrier spray that we apply every three weeks to offer continuous protection all season long. Combined with our tick tube program, which takes care of larval and nymph ticks in rodent dens, this offers a very strong defense against ticks which carry harmful illnesses. 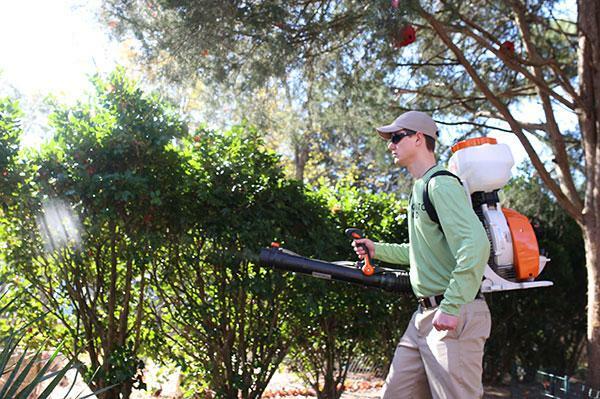 Mosquito Squad of West Montgomery leaves you with peace of mind to enjoy your yard throughout the spring and summer and well into fall. To learn more, we look forward to your call for a free quote at 301-444-5566 or email us at westmontco@mosquitosquad.com. Now is the time to think about tick tube implementation! Deer ticks in your backyard waiting for you to walk by. Along with our effective and proven barrier spray for ticks, you may have heard us talk here about tick tubes. Tick tubes are an excellent way to eliminate future generations of ticks on your property. 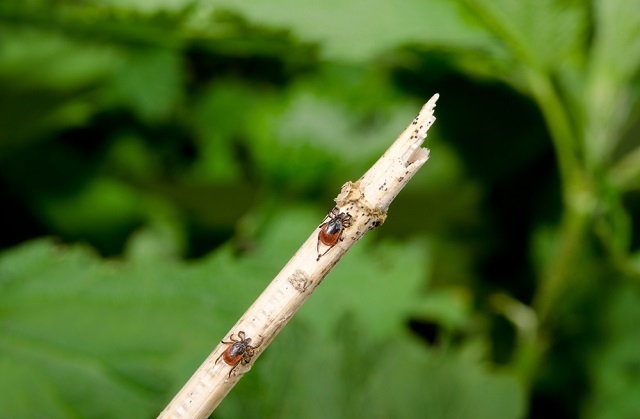 Along with our barrier spray, tick tubes are an effective second punch at eliminating ticks in your yard. So, what are they and how do they work? When is the best time during the year to use them? Tick tubes target nymph ticks. Ticks have 4 stages of development in their average two-year life cycle. 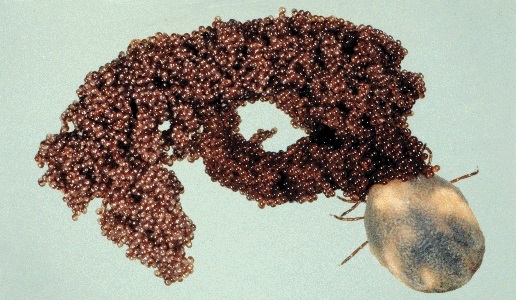 Ticks begin as eggs laid by female adults in late fall. In MD, ticks are most often found in the dens of white-footed mice. These mice provide the best conditions for them to develop. First, the mice build protected nests; second, they are warm-blooded mammals and can provide a blood meal for both larvae ticks and nymph ticks. Tick eggs laid in the mice’s nest in the fall will become larval ticks in early spring and need their first blood meal. When white-footed mice aren’t available, chipmunks, shrews, voles and other rodent nests will suffice. Egg mass produced by tick. After hatching from eggs in early spring, the larvae take their blood meal from the closest host they can find, the white-footed mouse whose home they live in. As they grow into nymph ticks, small rodents serve nicely as the tick’s second blood meal. Nymph ticks still aren’t very big so don’t need an animal with a big blood supply as they will need later when they become adults. 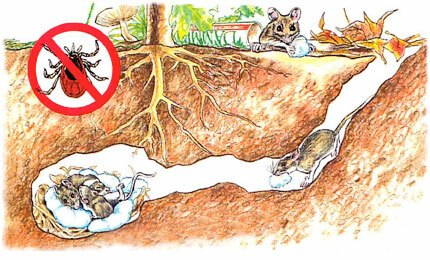 Because mice and ticks spend so much time together when ticks are in 2 of the 4 stages of their life cycle, the mice get bitten many times as hosts to both larvae and nymphs. The transmission of the Lyme infection from one infected nymph tick who previously took a blood meal from an infected mouse allows the infection to be transmitted to many ticks that later bite the same and other previously infected mice. The infection rate of mice with Lyme Disease is often as high as 80-90%. Ticks are not born with Lyme Disease and larvae ticks are never infected when they first enter that stage of their life cycle. Only after needing a blood meal at the end of the larvae stage can they become infected by infected mice. Given the infection of white-footed mice and the fact that larvae ticks are often found in the dens of white-footed mice, that first blood meal is where they ticks are likely to be first infected. The most prevalent source the tick acquires the bacteria is a rodent, such as a white footed mouse, or field mouse. As fall arrives, the nymph ticks are seeking a home for winter and a place they can get their next blood meal as they move into adulthood. Once again, they will seek out a white-footed mouse’s nest. In the second spring of its life, the nymph tick will take its second blood meal from the white-footed mouse whose nest it may be in. It is in this second spring that we and our pets are most likely to get Lyme Disease from a tick. Since nymph ticks are so tiny, we often don’t notice them on our skin, or on our dog’s skin. Why do ticks need to bite us for blood when they have the mice? It’s not often that ticks stay attached long enough to get a full meal from any one source. As they grow larger, they are above ground and not in nests and begin “questing” for any available animal. For this reason, a tick may bite several hosts (mice, other rodents, humans, etc.) before getting the amount of blood they need to continue growing into adulthood. Tick tubes are meant to make sure ticks don’t make it to their 2nd spring. In order to build a proper nest for winter, white-footed mice will search for nesting material. Mosquito Squad tick tubes have cotton balls in them saturated with insecticide that will eliminate ticks. By making their nesting material with the tick tube cotton, the mice will get the insecticide on their fur as they move around in their nest during the winter. When spring comes again, enough insecticide is on the mouse’s fur that the ticks will be eliminated on contact, before they can get their 2nd blood meal. No harm is done to the mouse by the insecticide, so they continue to serve as tick-destroying hosts during the warmer months of the year. By placing tick tubes out at spring, summer and fall your tick protection is supported by a second line of defense, tick tubes. Each year, as more nymph ticks are eliminated on your property, there should be fewer adults to lay eggs. Our barrier spray eliminates ticks on contact and works for up to 3 weeks on active ticks living in your yard. Tick tubes eliminate the ticks you won’t ever see. If you have questions on how to protect yourself from mosquito and tick-borne diseases, please contact Mosquito Squad of West Montgomery, (301) 444-5566. Can those pesky house mice spread Lyme Disease? You may have read stories before on this blog talking about the link between ticks, Lyme Disease and white-footed mice. These stories may have peaked your curiosity about other species of rodents, especially pesky house mice that like to take up residence in our homes. Since we are entering into the peak season for nymph ticks, and very soon, into the fall when the weather will be growing cooler and house mice will be looking for places to stay warm, now is a great time to become familiar with tick/mouse activity! White-footed mice do exceptionally well in the habitat of the Northeast US and other similar places because of the urbanization of old farmland. Open woodlots and brushy areas make ideal living conditions for white-footed mice and ticks. 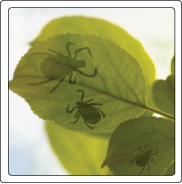 Although Lyme Disease is not as prevalent in some US states, other tick-borne diseases are. Tularemia, Rocky Mountain Spotted Fever and other infections are often prevalent in places Lyme Disease is not. Shrews, voles, rabbits, chipmunks and other small rodents will fill a similar role as white-footed mice in these regions when available. 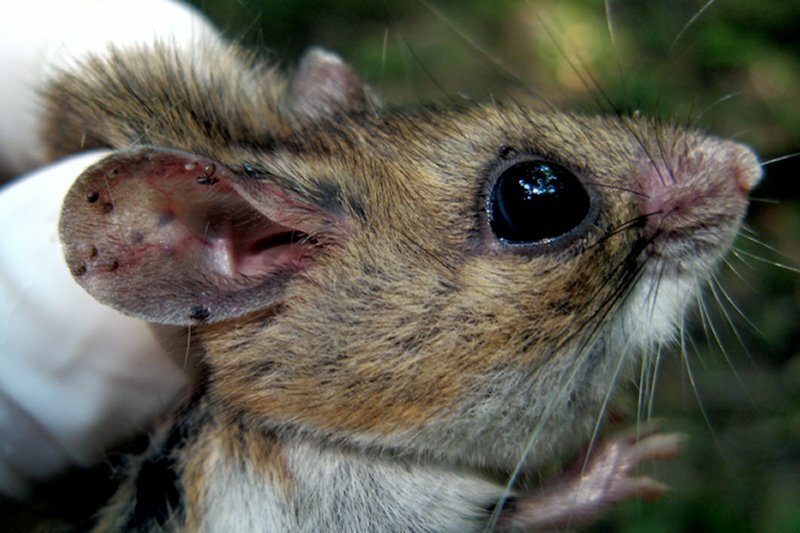 Notice this white-footed mouse is covered with nymph ticks. When an adult female tick needs to lay her eggs, she looks for a location that will have a temperature warm enough in winter to allow her eggs to survive. White-footed mice build nests in burrows, stumps, brush piles, buildings and in the abandoned nests of other small animals and birds. These nests provide concealment for them from predators and warmth in the winter. When an adult female tick lays her eggs in the nest of a white-footed mouse, she is providing both protection and a good start for the next generation. When hatched into larvae in the spring and early summer, these ticks will take their first blood meal from the closest available small animal, which is usually the white-footed mouse. Tick larvae are not infected with Lyme Disease when born. Their first chance to be infected is when they take their first blood meal from the mice. As these larvae ticks grow and need a second blood meal to grow into their third life stage as nymph ticks, the mice will often serve as hosts to that meal also. Studies show that 80-90% of all white-footed mice are infected with the Lyme bacteria. When you consider the number of larvae and nymph ticks that take their blood meal from white-footed mice, you can easily see why the infection rate is so high. 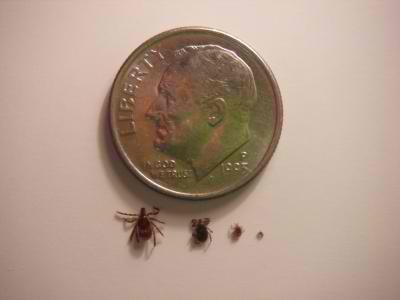 Ticks will often have to bite more than one host for a blood meal in order to get an adequate supply of blood, so they can grow into their next life cycle stage. If one larvae or nymph tick is infected with Lyme Disease, the infection will usually be transmitted to any of the mice they bite. Ticks that bite an infected mouse have a very high likelihood of becoming infected themselves and further transmitting the disease. As ticks become larger, they need larger mammals and birds for their blood meal. This is how Lyme Disease is transmitted to raccoons, foxes, opossums, birds, and other small mammals. Deer serve as hosts for adult ticks because of their size allows them to have enough blood to provide many adult ticks their blood meal to lay eggs. House Mice nesting in a loaf of bread. For mice that do not frequent open woodlots and brushy areas, there is little chance of them being exposed to ticks. No contact with ticks means no Lyme infection. This is the primary reason that Lyme Disease is rare or non-existent in mice that seek shelter and warmth in your home. As these or any mice spend time in your yard and in tick habitat, it’s possible they can become infected, if bitten by an infected tick. House mice have not been studied to determine if they contract Lyme Disease in certain situations; but there is no reason to think they would be immune. It’s likely they are not a vector for Lyme Disease because they simply don’t spend as much time in tick habitat as other rodents. As you can see, the circumstances that lead to Lyme Disease are diverse and complex. With so many vectors, hosts and reservoirs responsible for the disease, researchers are a long way off from knowing how the disease continues to spread. Rather than wait for science to provide a solution, there are effective solutions now such as barrier sprays and tick tube implementation for your yard. Contact Mosquito Squad of West Montgomery now to discuss our tick barrier spray and tick tube program that will protect your yard all season long. Are Humans The Only Ones Who Get Lyme Disease? 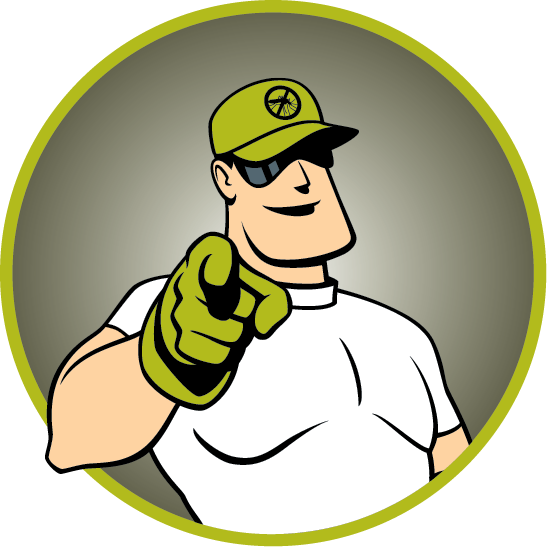 Mosquito Squad of West Montgomery wants to keep you informed about Lyme Disease! You may know that ticks get the Lyme bacteria, Borrelia Burgdorferi, from the white-footed mouse and then pass it on to us. However, do the mice themselves get Lyme Disease? Do they get sick? What about all the other animals that ticks bite, like chipmunks, squirrels, raccoons, foxes, coyotes, birds and the like? The list of animals that ticks bite is a long one. In order to make sense of the research, we need to break down this list. It is easier to understand how Lyme Disease exists in wildlife by talking about small, medium and large animals, and birds. The size of the animal seems to make more of a difference than the specie when discussing how Lyme Disease affects wildlife. All size deer ticks can transmit disease. How is Lyme Disease transmitted? Before discussing how Lyme is transmitted, we need to define two terms. The first is the term, host. A host is, as you would expect, someone who serves someone something. In the tick’s case, the host is the animal or bird who serves them their blood meal after the tick bites them. A tick needs a blood meal in each of the three stages of its life cycle, larvae, nymph and adult in order to grow and move onto the next stage. The second term we need to define is reservoir. Since ticks aren’t born with Lyme Disease, they need to get the bacteria from somewhere. The term reservoir refers to where the bacteria are present. Many animals can be reservoirs for the Lyme bacteria, Borrelia Burgdorferi. Some reservoirs have an abundance of bacteria in their blood. In other animal reservoirs, there may be very few Borrelia Burgdorferi bacteria. An animal with a large number of bacteria in their blood are referred to as a competent reservoir. This means they have enough bacteria to infect any ticks that bite them. Other animal reservoirs can be incompetent reservoirs, meaning they have so few bacteria present they will not infect the tick when it bites them. Small animals White-footed mice, chipmunks, rats, squirrels, moles, voles and certain species of birds are competent reservoirs. These animals are often infected with Lyme Disease, as well as Anaplasmosis and Babesiosis. These small animals are the ones most responsible for transmitting Lyme Disease to larvae and nymph ticks. Since larvae and nymph ticks are often in the dens and burrows of these animals, they are often the young tick’s first blood meal. The small ticks in this life stage do not need a lot of blood for their first meal. Adult ticks need a larger animal for their larger blood meal. Although studies show these small animals are often infected with Lyme bacteria, there has been little to no research into how the disease affects them. Whether they get a rash or sick from the bacteria is unknown. One study that looked into the mortality of white-footed mice and showed 93% of them succumbed to predators, primarily weasels. Only one mouse death in the study was attributable to Borrelia Burgdorferi bacteria. From this study, we can hypothesize that most or all of these small animals can succumb to the infection, but it is not common. Is the lifecycle of the white-footed mouse so short or predation so high, that Lyme Disease doesn’t have a chance to take more of them? We simply don’t know. Many studies have shown that birds are often infected with Lyme Disease and are responsible for its geographical spread. One NIH study found, “ticks have detrimental effects on their avian hosts even under natural infestation conditions…and may also present symptoms of infection, though these may be subtle.” Birds do seem to be affected physically by the Lyme bacteria; however, it is not acute or obvious. Lizards may also become infected with Lyme Disease but are incompetent reservoirs. Medium size animals Raccoons, groundhogs, rabbits, beavers, opossums, foxes, bobcats and coyotes rarely serve as reservoirs for Lyme Disease. Scientists also do not find many ticks on them when sampled. That doesn’t mean they don’t transmit other diseases. Rabbits transmit tularemia, rarely Lyme Disease. Beavers, like rabbits, transmit tularemia but are not identified with helping to transmit Lyme Disease. Groundhogs transmit bronchopneumonia and hepatitis B primarily. Squirrels transmit tick fever and their fleas can transmit plague. Coyotes are incompetent reservoirs of Lyme Disease. Foxes are also incompetent reservoirs of Lyme Disease. Foxes provide a benefit when it comes to Lyme Disease because they are predators of white-footed mice reducing their numbers. Even when the Lyme bacteria are found in these medium size animals, the bacteria present is minimal, making these animals incompetent reservoirs. No research has been done on how or why the Borrelia Burgdorferi bacteria present in them is so low. Whether some of these animals have less exposure to ticks carrying Lyme, or whether their immune system is prepared to prevent a significant infection, is not known. Some scientists and studies have hypothesized that these animals may have a “primitive immune system” but no scientific definition exists for that term. No studies exist to confirm or deny it. Large size animals The only wild large size animal in the tick lifecycle is the deer family. White tail Deer as well as other members of the deer family, including elk, moose and caribou are the blood meal host often chosen by adult ticks. First, several thousand ticks can attach to deer because of their size. This number of ticks makes it easy for males to locates the female ticks as ticks use deer to find a mate much like a local “pick-up” joint. A female tick will use a deer to consume a large blood meal, in order to lay a clutch of 2,000 to 18,000 eggs. Elk and moose carry dog ticks in the West, which are often infected with Ehrlichiosis and can be transmitted to humans. With the introduction of elk and moose in the Eastern US, no one knows the effect they may have in Lyme Disease and Ehrlichiosis transmission. All deer are incompetent reservoirs with low levels of Lyme bacteria in their blood, despite the number of ticks that bite them. Once again, scientists attribute the deer’s immunity to a primitive immune system or an ability to flush the bacteria from their blood. Based on numerous research papers, it is clear that the animals most responsible for transmitting Lyme Disease are small ones, especially white-footed mice, voles and other rodents. 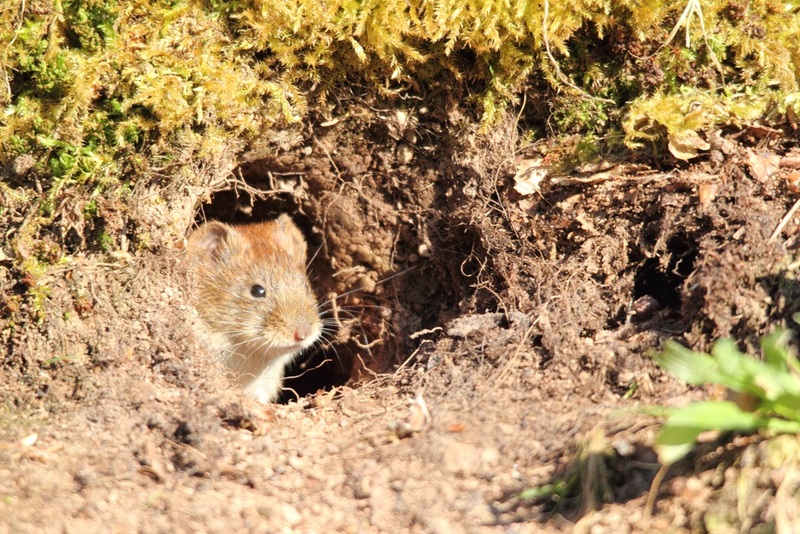 Research studies show that voles become important in the transmission of Lyme bacteria mostly in areas where few white-footed mice exist. Medium size and larger animals and birds spread the disease further geographically that any of the smaller animals because of their territorial ranges and their effectiveness in giving infected ticks a ride to new locations. Tracing the epidemiology of Lyme Disease is complex, as you can see. With so many vectors, hosts and reservoirs responsible for the disease, researchers are a long way off from knowing how the disease continues to spread. Rather than wait for science to provide a solution, there are effective solutions now such as barrier sprays for your yard. Contact Mosquito Squad of West Montgomery now to discuss our tick barrier spray and tick tube program that will protect your yard all season long. The importance of protecting against Lyme Disease in Montgomery County, MD. 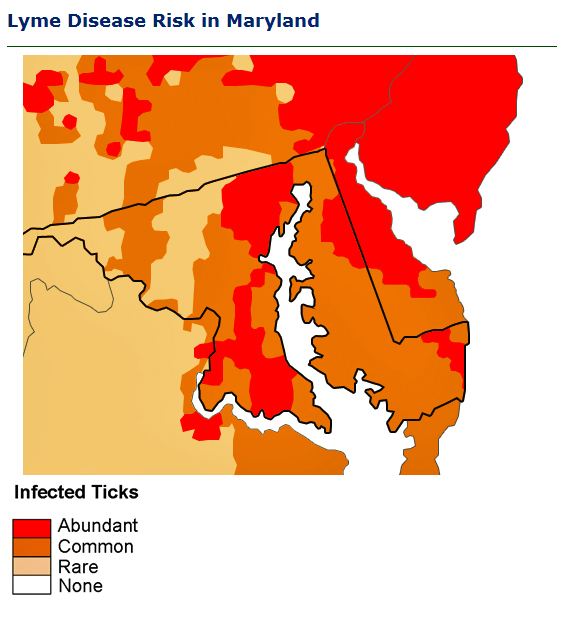 CDC map indicating Lyme Disease risk in Maryland. Lyme Disease is a multisystem illness caused by Borrelia burgdorferi, a spirochete transmitted by certain species of Ixodes ticks, including the highly prevalent Deer tick. Approximately 30,000 confirmed and probable cases of Lyme Disease were reported in the US during 2012, primarily from high-incidence states in the Northeast which include: Connecticut, Delaware, Maine, Maryland, Massachusetts, New Hampshire, New Jersey, New York, Pennsylvania, Rhode Island, and Vermont. Cases were also reported in the upper Midwest. According to the Maryland Department of Health and Mental Hygiene Lyme Disease is the 3rd most notifiable disease in Maryland and the most common tick-borne illness reported in the state. This data suggests the importance of keeping you and your family safe from ticks in Montgomery County, MD in order to avoid Lyme Disease. For residents across Maryland, protecting yourself and your family from the dangers of Lyme Disease needs to encompass year-round awareness, not just during the typical tick-active periods during hot weather. Even in winter, ticks can bite on warm days, and climate change is lengthening the seasons when ticks are most active which makes reducing the risk of contracting a tick-borne illness a challenge. This regional epidemic has begun to trigger a broad public health response on target with prevention campaigns aimed at some other vector-borne illnesses, such as West Nile Virus which is spread by mosquitoes. Ticks are quite a devious foe, and require knowledge and awareness in order to overcome rising deer tick populations within our region. 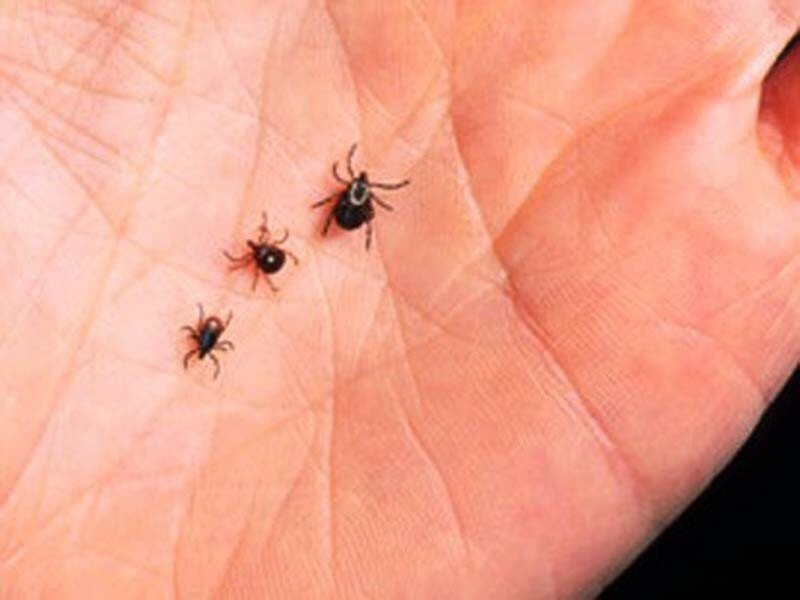 All size deer ticks can spread Lyme Disease – nymph to adult. Lyme Disease is caused by being bitten by a deer tick carrying Borrelia burgdorferi which causes the disease. All sizes of deer ticks are capable of transmission. People and animals, including pets, can become infected with Lyme Disease. The same deer tick that is responsible for Lyme Disease within is also responsible for the spread of other tick-borne illnesses such as Babesiosis, Anaplasmosis and Ehrlichiosis. It is also very possible for the deer tick to infect its host with more than one germ in a single bite, which is referred to as comorbidity. The disease can affect the skin, joints, heart and nervous systems of its victims. In order to infect a host, the deer tick which carries the bacteria has to remain attached on its host for at least 24 hours in order to spread the disease. 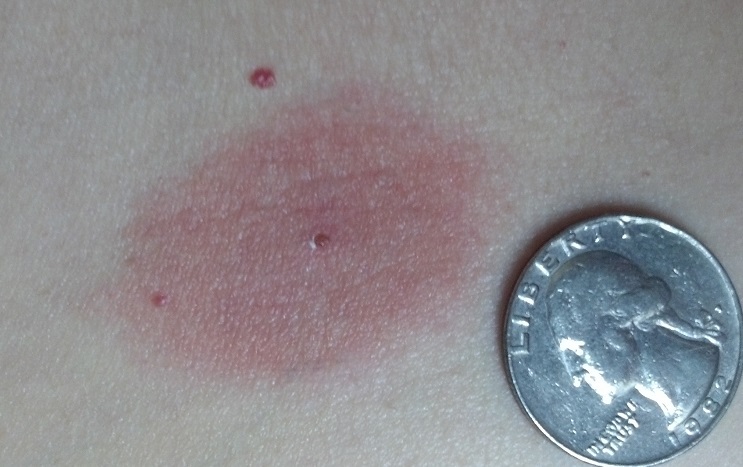 Lyme Disease displays symptoms in multiple phases of which the first, called the early stage, and is often, but not always, characterized by a rash on the location of the bite area that resembles bulls – eye or donut. The rash, medically referred to as erythema migrans,begins as a small red area that progresses outward hence the comparison to a bulls-eye. Early stage symptoms may also include fever, fatigue, lethargy, depression, stiff neck, muscle and joint soreness and headaches. In many cases the early stages of the disease are mistaken for the flu, and are unreported or misdiagnosed. These early stage symptoms usually appear 3 to 30 days after being bitten by an infected tick, and as with any occurrence of finding a tick attached to your body, your should remove the tick properly and keep the tick in a container and date it should any problems arise or if the tick is needed to further test for the presence of disease. Later stages of Lyme disease can become evident weeks and even years after being infected. 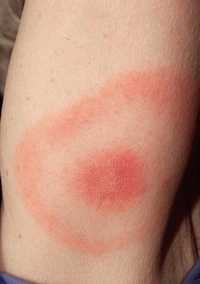 The well-known bulls-eye rash associated with Lyme Disease. When caught early, most people recover quickly from the disease with antibiotics, but up to 25% of people report feeling unwell after treatment — sometimes for months or years. There is enormous controversy among doctors and members of the public about why these patients are sick and how long symptoms can last. But there is no doubt that Lyme is a significant health threat. Untreated, the disease can cause a range of symptoms, from facial paralysis to arthritis and heart problems, to more common complaints of fatigue and headaches. Deer ticks are known vectors of transmission of four other diseases to humans, and this past summer a new disease was added to that list. This new disease is not yet named, but closely resembles Lyme Disease and is spread by the deer tick by a newly discovered bacteria called Borrelia miyamotoi. This new illness might even explain cases of what looked like chronic Lyme Disease, but did not test positive for Lyme. The most effective way for Maryland residents to reduce the risk of becoming infected is to raise awareness of the factors that contribute to the disease and educating residents on how to avoid and prevent ticks. In order to avoid and prevent ticks, you are urged to take control of your property to make it less hospitable for ticks and to exercise good tick sense. Since ticks lurk and thrive in brushy wooded areas, and high grass, keeping your property trimmed, mowed and free of debris and deadfall is a good starting point. Wood and brush piles, fences and rock piles are favorites among ticks and these areas should be kept tidy and you should not allow your yard, or underlying areas to become overgrown or unkempt. It is a wise choice to avoid areas where you know a tick infestation may be lurking and to contact a licensed professional to have these areas treated to eliminate the ticks. Whenever frequenting an area that might be a possible hot spot for ticks, make sure you wear appropriate clothing and shoes and frequently check yourself for ticks. Lighter colored clothing makes detecting a tick easier. Make sure to shower immediately upon returning home from any outside endeavor within a potentially tick infested areas. Conduct regular inspections on your pets when venturing outdoors. With pets, even if your pets are on topical tick preventative this does not guarantee against a tick hitching a ride to on your dog or cats fur only to feed on you later. Small children should also be checked thoroughly after outdoor play. Part of our highly effective tick prevention and control program here at Mosquito Squad of West Montgomery includes the use of tick tubes. Tick tubes are small tubes filled with cotton that has been treated with an insecticide formulated to eradicate ticks. We place the tubes at random locations throughout your property where mice are likely to reside, such as the edges of wooded areas, and on the outskirts of tall grassy areas. The mice will use the treated cotton within the tick tubes to build their nests and in doing so will eradicate the deer tick that feeds off the mice during the ticks early stage of life. By eliminating the tick before it evolves to feed off other mammals, including humans, you decrease the chances of being bitten within your property. Tick tube implementation, when used in conjunction with our barrier spray program, can reduce the number of Lyme infected ticks on your property by up to 90%. Remember the key to a healthy, happy insect-free season starts in your own backyard!